Add a Contemporary ambiance to your living space with this cosy two-piece set. Modern scoop chair design and matching downward curving ottoman are enhanced by leatherette upholstery with tufted accents to provide endless comfort. 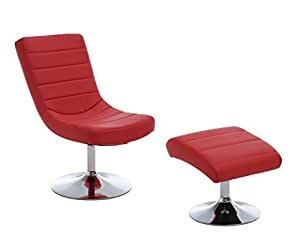 Material: Chrome, Faux leather, Foam, Upholstery colour options: Black, red or white Faux leather upholstery Scoop seat Curved ottoman Chrome finished base Tufting detail Set includes: One (1) chair and (1) ottoman Assembly required Hardware and instruction manual included Chair dimensions: 20.5″W x 31″D x 35.25″H Seat Height: 17″ Seat Depth: 18″ Ottoman dimensions: 18″W x 16.75″D x 16.5″H.